Rihanna had the final word after body shamers called her "too fat"
It’s impossible to not praise everything Rihanna does. Not only is she a musician and a humanitarian, she’s also an icon and a body-positivity activist. She reminds us that we don’t have to apologize for existing. From wearing plunging red dresses that make us feel empowered to shutting down haters on Instagram, Rihanna knows how to make a statement. The latter happened just last week, when a fan account posted a video of the singer and addressed the fact that some haters have called Riri fat. Not only is this rhetoric harmful because it equates being fat with being ugly, but it’s also untrue. And thankfully, Riri knows that. The video posted shows our queen and savior at the gas station, stocking up on some classics like Cheetos, cereal, and chips. Of course, Rihanna looks amazing wearing a full-length polka-dot shirtdress and cut-offs, with her long red hair in curls. The caption for the video is a clap back at everyone who thinks this goddess is fat because look at her. Apparently, Rihanna is unfazed because she didn’t even know that’s what people thought of her. 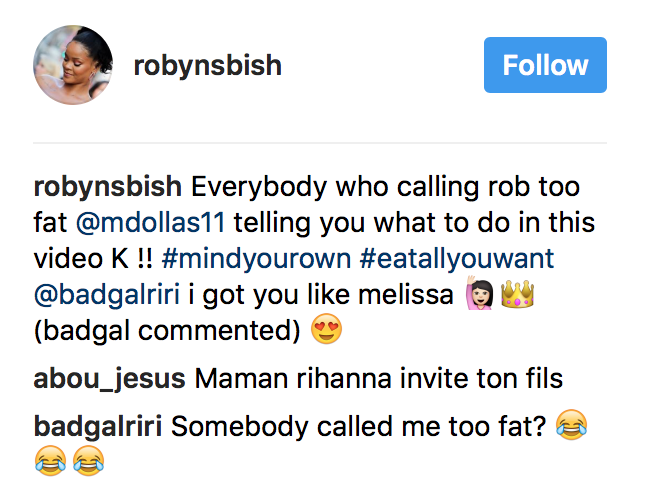 Badgalriri left a comment asking if someone called her “too fat,” followed by three laugh-crying emojis. Honestly Rihanna, SAME. Haters make you famous, and anyone hating on Rihanna is missing out on appreciating all she has to offer. We also love that she left a comment on the video, reminding us that life isn’t meant to be taken quite so seriously. If Rihanna can laugh at herself, so can you. No harm, no foul.